A fashionable collar that will stand the test of time. The fine leather offers comfort and durability and the nickel and stud ornaments are a classic. Customize this masculine look with all nickel or mix the nickel with the brass hardware. Sizing starts in size 14" will have a single row of alternating studs as shown, a great collar for the bigger dogs. All sizing will have the center D-ring so you will be able to show off the ornamentation when attaching a leash. 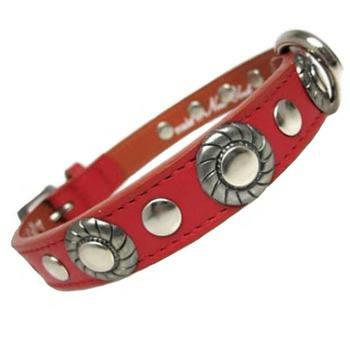 Please choose your collar color and solid nickel ornaments or mixed brass and nickel.